This is one of the most attractive of the little Speedwells, for its flowers are bright and quite large. The stems are branching, hairy and purplish, some short and erect, others long and trailing, and the leaves are alternate above and opposite below, dull yellowish-green, hairy and rather soft, with scalloped edges. 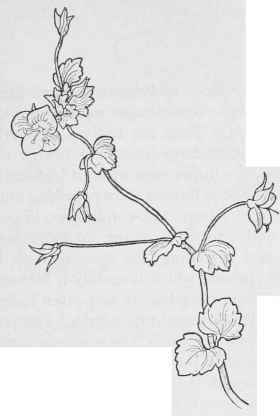 The flowers grow singly, on slender flower-stalks over an inch long, springing from the angles of the upper leaves, and the corolla is three-eighths of an inch across, the upper lobe deep brilliant blue, veined with dark blue, the side lobes similar in color but not so bright, the lower lobe almost white, without blue veins, and each lobe with a little pale yellow at its base. The stamens and pistil are white, the anthers becoming brown and the style bent to one side, and the capsule is somewhat heart-shaped, containing several cup-shaped seeds. This forms patches along roadsides and in fields, the soft foliage dotted with the quaint bright blue flowers, opening a few at a time in bright sunlight and closing at night. This is a native of Europe and Asia and is found across the continent.